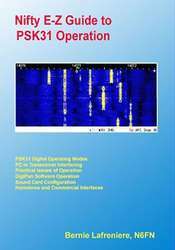 Learn how to setup your station for PSK operation. Using the very popular DigiPan software as a basis, a simple approach is utilized for configuring your interface hardware, software and computer system. Separate chapters are devoted to the installation and setup of three different PC-to-radio interfaces. You'll also explore the pros and cons of building a home-brew interface or purchasing several types of commercial interfaces. Designed to help you get PSK31 up and running quickly and easily. Light on theory, it concentrates on the practical issues of getting things connected and making PSK31 QSOs. Experience the fun of PSK31 with this step-by-step guide!